Today’s guest post offers some great strategies on how to make the most of closet corners complete with diagrams. I love diagrams. I wish I had a diagram for everything in life. It would make things so much easier wouldn’t it? 🙂 There is no affiliation here, I just thought it was interesting info that might be helpful to some of you. There are hundreds, possibly thousands of ways you can customize a closet for better organization and use of storage space. Closet accessories, closet organizers and custom closet systems are just a few, but what do you do about those tricky closet corners? This is a problem for many households, so we’ve put together a list of easy do-it-yourself solutions to maximize space in closet corners. Overlapping hanging rods in closets create a square shaped space in the corner where nothing fits and it’s impossible to see or access your clothes. For a quick fix, shorten one of the closet rods by at least 24” and then reinforce the hanging rod with a closet support bracket if needed. One closet rod will stop short of the adjacent wall, creating not only more hanging space but also making it easier to see and access clothes on both sides. For further closet corner accessibility, adjust the closet rod heights when shortening closet rods or fixing overlapping poles. When closet rods of the same height meet in the corner of a closet, although functional from a storage standpoint, it’s challenging to access clothes or hangers that are located towards the far corner. In this example, one wall has only a single long hanging closet rod at 70″ high; while the adjoining wall includes a double hanging section where the closet rods are 80-84” high and 38-42” high. Much like kitchen cabinetry, some shelving units are made specifically for corner spaces. They can be “L” shaped or angled; either configuration can maximize storage in closet corners by adding space for folded clothing, boxes, shoes and linens. This is a great solution for those who have more shelving items than hanging clothes or if the closet dimensions present design challenges to incorporate storage goals. If you want to maximize space throughout your entire closet with closet organizers, proper closet section spacing should be utilized in all corners. A general rule of thumb is to leave 12″ of empty wall space between closet sections in a corner. (24” from the adjacent wall to a closet section… assuming shelving is 12” deep.) This allows full access to clothing hung in the corner space. In this example, the left wall includes a shelving section and stops short 24” from the corner. The adjoining wall can then accommodate the hanging sections beginning from the corner. Hanging clothes in the corner are accessible by the 12” spacing between the adjacent sections. If possible, avoid placing hanging sections on both sides of the corner, but if you must, vary the heights of the adjacent closet rods; this will create a design that allows for better garment accessibility. Whether you opt for simple closet rod adjustments or DIY closet organizers, either route you choose will result in added space and less clutter! 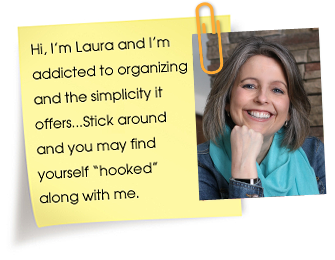 Tabitha Kokoska has years of experience in the closet organizer and design industries. As Creative Director for ClosetPages.com, she manages the website’s closet organizers blog and contributes to the monthly newsletter. Hi. I would love to have my closets organized but mine are 3 feet deep and maybe 6 feet long. We live in an old house and they didn’t make walk in closets that long ago. 🙂 If you ever get a chance to post ideas about smaller clothes closet organization I would love it. I love your posts and hope to start using the ideas in my home soon. Joan – believe it or not, I just moved to a remodeled home built in 1920…even though there are upgrades, my new master closet is not much bigger than yours. I’m just now getting together ideas of what I want to do in that space (we still have some unpacking to do). I hope I can share the outcome somehow when it’s finally done or help with ideas if I can. There are some great ideas on this site too if you search for “closet”. This takes a handyman, but this is what we did with my son’s closet that is long and not so deep. The back corners were useless and hard to get to. We made these shelves/drawers. Inside behind the shelves is room enough to stack plastic bins for out of season items. This gave me some good tips to deal with our unruly master closet – thanks! This reminds me of when I designed a closet for a new home and the builders took it upon themselves to not leave the 12″ space between the corner and side sections of closet. They just ran the rods straight across and overlapped them in the corner. This would have been perfect to show my client & the cabinet builders! Great diagram and explanation of closet space solutions!!!! I really like the diagrams – thank you!! Cheers to fresh starts and God Bless the things that motivate us to just get started with something. I think there’s always to make extra storage space in the closet, you just have to be creative. Breanna, also from my experience good organizers are a great way to organize things! Great article with helpful tips. The diagrams were certainly a plus, as sometimes it is hard for me to visualize from just reading an article. Thanks! I’m so glad the diagrams were helpful! I like to display examples of what I write about whenever possible. I hope everyone is having a great holiday season! Your diagrams look really professional. I am neither spacially inclined, nor am I good with my hands. I would like to do this myself, but I will most likely call a closet solutions company to help me out. what software did you use to design these? You would have to contact Tabitha to find out. Sorry I’m not sure myself. What are your thoughts on pull down drawers? I’m trying to decide if they are worth the investment. I like the idea for spall kids clothes and soccer stuff. Something like this drawer with the white shaker fronts. I do like them however for kids stuff it would really depend on the ages of the child. Young children may not be able to reach down to the bottom to get what they want. Hi there! Love your site and ideas, thanks for sharing! My husband has just built me walk in closet space, and now I need to find an organizer to fit in and maximize the space. The issue is that one wall has a slanted ceiling and the slant, starts about 2 feet from the opposite wall. Any ideas for each side, the slant, wrapping around corner? thank you!